The Bobcats were treated to an early tour of Merlis Belsher Place, alongside Belsher (far right) and Mike Jenkins of Huskie Athletics (far left). A team of young hockey stars recently ventured beyond the tarps and yellow tape at Merlis Belsher Place, currently under construction on the U of S campus. 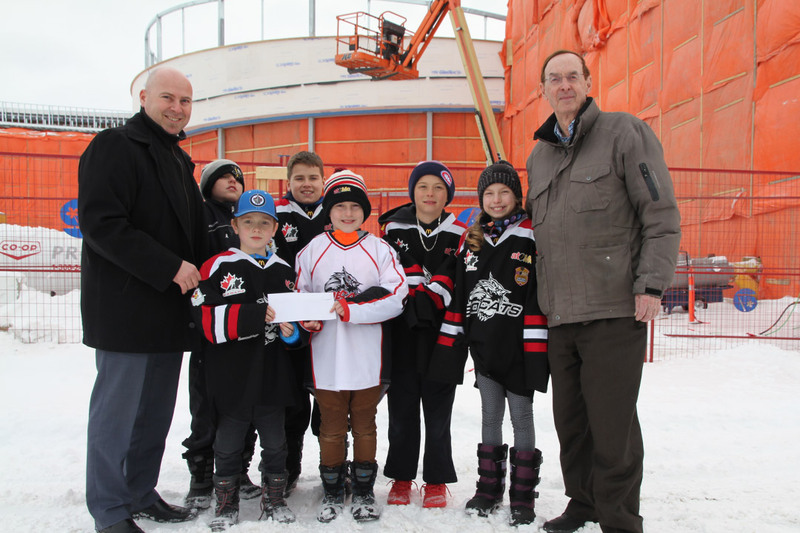 The co-ed novice Bobcats hockey team, players ages 7 and 8, raised close to $1,000 for the construction of Merlis Belsher Place. As a thank you from Huskie Athletics, on March 5 they donned hard hats and fluorescent vests and were treated to an early tour of the building—the first team to do so. Their enthusiasm to play here makes it all worthwhile. Also joining on the tour was philanthropist and founding donor Merlis Belsher, who took notice of the team’s palpable excitement. Merlis Belsher Place will replace the aging 88-year-old Rutherford Rink with a new dual-ice pad facility and multisport complex. The facility will be home to the Huskie hockey programs and will provide practice facilities for Huskie basketball teams, as well as dressing rooms for Huskie soccer, dedicated space for campus recreation and community sports teams. Made possible by $42.9 million in joint funding from the U of S and a variety of donors—including generous contributions from Belsher, Ron and Jane Graham, and the City of Saskatoon—the new multi-sport facility is on schedule to open later this year.